Karen`s Nature Photography: Annual Honesty Seed Capsules. Decaying Chinese Lantern Seed Capsule. Crappaple Flowers Against Blue Sky. Empty Annual Honesty Seed Pods. Chinese Lantern Seed Pod Skeleton. 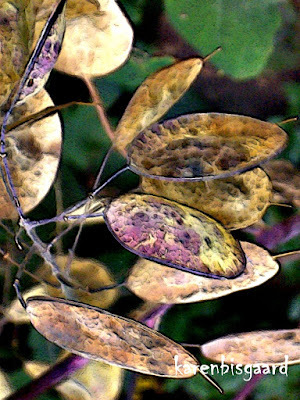 Annual Honesty Seed Capsules Close-up. Stone Fence and Red Berries. Old Shed Next to Cottage. Marigold Seed Heads and Green Leaves. Rowan Berries Against Cloudy Sky. Snow Berries Next to Birch Trunk.